As a fashion student, I’m constantly reading fashion features in magazines and keeping an eye out for pieces to pick up for myself that I can afford on a little student budget. Now I was reading a certain magazine on the train home last weekend – *cough* Company *cough* – that I’ve read for a couple of years now, but with each and every fashion article I was reading, I noticed how ridiculously unaffordable the pieces being featured were, particularly for the older teen/student market it is aimed at. There were £80 pairs of jeans from brands I’d never heard of, and not one jacket featured was under the £100 mark, making everything instantly out of my budget – there’s aspirational fashion and then downright out of my reach, so it got me thinking and wishing that magazines would start to feature more and more high street, budget-friendly yet still fashionable pieces, so that is what I’ll be writing about today. I’ve put together three on-trend Spring time looks for three different budgets – £50, £75 and £100- all from affordable high street brands that are offering student discount on top. For the £100 and under look I’ve based it on an effortless everyday outfit, and I’ve gone for this timeless cream shift dress from H&M and teamed it with co-ordinating accessories. These cut-out tan sandals from Missguided will become a SS14 staple, and will look cute with ankle socks whilst it’s still a bit chilly and the tan shade really compliments the cream dress. The matching tan satchel from Boohoo is the perfect size for a days essentials. The tan band on this hat from Catarzi (via ASOS), ties all the accessories together, whilst the black prevents the tan from taking over. I’ve finished off the look with a set of 5 gold bangles from Primark which will make a statement stacked up the arm. Outfit two is all about the huge pastel trend which is coming through for the Spring and is based around this pink coat from Boohoo which will be a key piece for SS14. Teamed with this gorgeous playsuit, again from Boohoo, it combines the whole pastel colour palette together without being too overpowering. The long sleeves also make it fab for the cooler spring days and the perfect transitional piece. The strappy sandal trend is still huge, and New Look are spot on with their beige and pink version, and they completely compliment the coat. If strappy sandals aren’t your thing or it’s a rainy day, I’d swap there for some knee high socks and plain wellies in contrasting pastel shades. To add a fashion edge to this look I’ve added this pink ASOS scrunchie which will look super cute with your hair in a high pony! 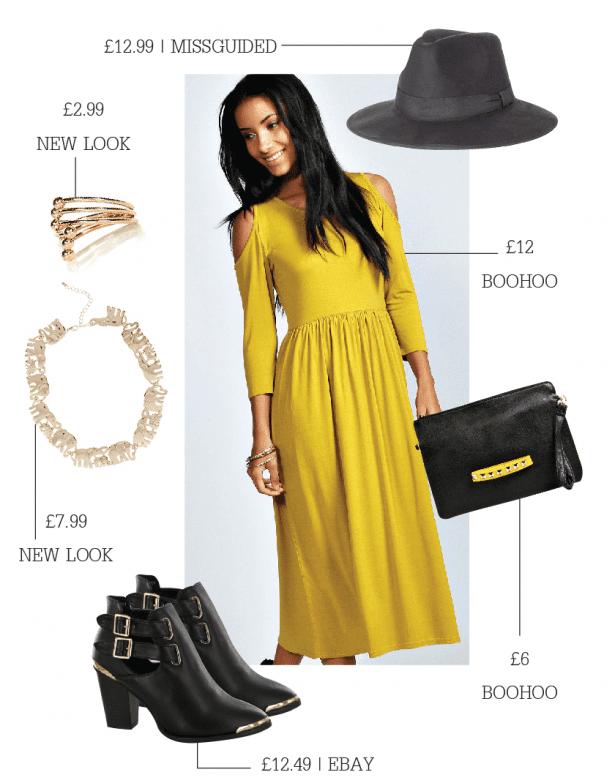 This yellowy mustard shade is hitting the high street big time this season, and Boohoo have got it spot on with this gorgeous midi with the cut-out shoulders. The skater style will also compliment any bodyshape or size. This dress is just shouting city shopping trip to me, so I’ve kept accessories simple. Boohoo have the perfect complimenting clutch to match the dress, and the studs tie in with the gold jewellery which is all from New Look – I love the little elephants on the necklace, a definite new take on a statement necklace. 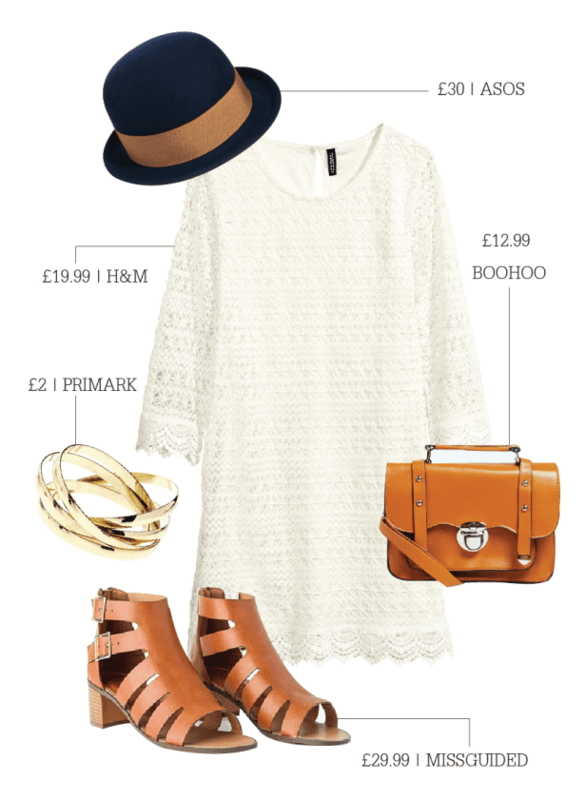 A hat is again key to this look, and Missguided have this super versatile fedora which will be perfect. To finish off the look I found these staple cut-out ankle boots on Ebay and their gold hardware really tie the whole look together.